Reno's National Automobile Museum is rated by AutoWeek as one of America's top five automobile museums and one of the 16 best museums of its kind in the world. When you visit, you will see why as you wind your way among exhibits of the early days of automobiles through to the present day of amazing cars. The National Automobile Museum began as the collection of vehicles accumulated by William F. "Bill" Harrah of Nevada casino fame. After he died in 1978, his properties, including the automobile collection, was purchased by Holiday Corporation. When Holiday announced its intention to sell the collection, a private non-profit corporation was formed to preserve the cars and keep them in Nevada. The result was the National Automobile Museum (The Harrah Collection) being built on land in Reno and opening in 1989, thanks in part to many donations, the City of Reno Redevelopment Agency, and an appropriation from the State of Nevada. 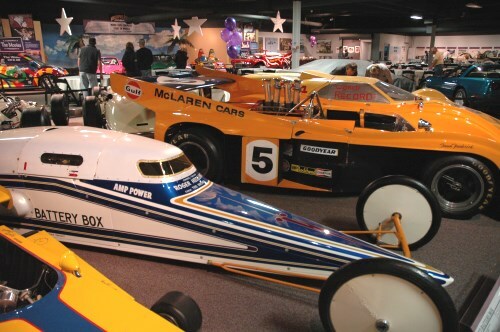 The National Automobile Museum has both permanent, ongoing exhibits and changing exhibits. Many of the cars are displayed in period street settings. As the name implies, changing exhibits rotate in and out - check the Exhibits page to see what is currently on display. Here are the permanent exhibits, which are arranged in galleries from the 1890s to the 1950s and beyond. Guided tours, audio tours, and smart phone tours are available. Available online is Auto Informant, providing pictures, history, and stories about over 200 vehicles in the Museum's permanent collection. Hot August Nights is always an occasion for something special at the National Automobile Museum. Another regular special event is "Trick or Treat in the Streets" on Halloween. For a complete list, visit the Museum Calendar. Facilities inside the National Automobile Museum can be rented for corporate meetings, luncheons, receptions, sit-down dinners, weddings or other special events. To learn more about this service, contact the Museum. The National Automobile Museum is open every day except Thanksgiving and Christmas. Hours are Monday through Saturday, 9:30 a.m. to 5:30 p.m., and Sunday 10 a.m. to 4 p.m. Admission is free for members, $12 adults, $10 seniors (62+), $6 ages 6 to 18, 5 and under free. Tours and theater presentations are included. The National Automobile Museum is located at 10 S. Lake Street (corner of Mill and Lake Streets), next to the Truckee River. The original Reno Arch spans Lake Street in front of the Museum. Parking in the Museum's lot is free. For more information, call (775) 333-9300.